AG Muwanga address mismanagement of public funds in the Local Government; staggering amount of funds that disappears! I hope this does not boggle your mind. Bear in mind that the Uganda Revenue Authority (URA) lots of scrutiny for paying bonuses on a Tax-Case against Tullow Oil Corporations. This has led to giant pay-out’s to fellow loyalists in the regime and in the civil service, and other who helped the arranged case that they won in favour of the URA and the NRM; so that AG Muwanga tells about bad practices in the districts and counties is not surprising. When I went through the local portfolios during the campaigning, there was usually funds not spend or even unaccounted in a dozens districts. That was last budget year, not the one mentioned from the AG this time around. “Auditor General, John Muwanga, who presented the report to the Speaker of Parliament, Rebecca Kadaga at Parliament on January 4, 2017, said the accounting officers attributed the irregularities to challenges encountered during decentralization of salary payments on the Integrated Financial Management System and Integrated Personnel and Payment System. “Many of the accounting officers explained that they had initiated the process of recovering the overpaid amounts and training of staff to build capacity and address the challenges. 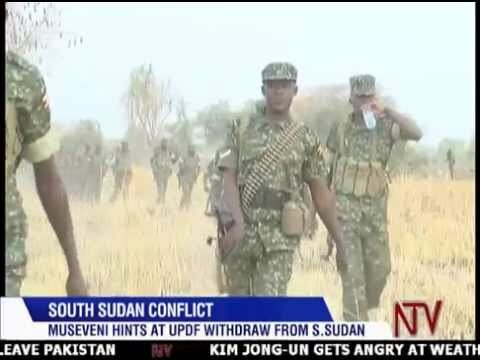 I wait for evidence to that effect,” Muwanga stated in the report. 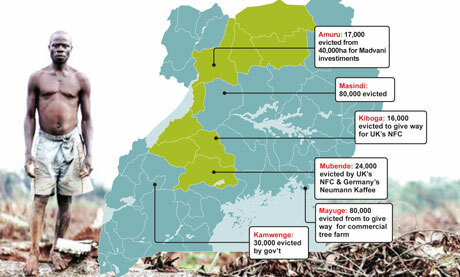 At least 33 local governments are quoted to have procured items worth Shs 27.5 billion without following public procurement regulations and guidelines. Out of this, Shs 1.3 billion lacked procurement files; Shs 21.2 billion where there was breach of procurement procedures; Shs 4.6 billion involving inadequate contract management and Shs 315 million from unauthorized contract variations. About Shs 3.8 billion was identified as funds unaccounted for by the local governments. “I could not confirm that the funds were utilized for the intended purposes. The delayed submission of accountability may also lead to falsification of documents resulting into loss of funds”. 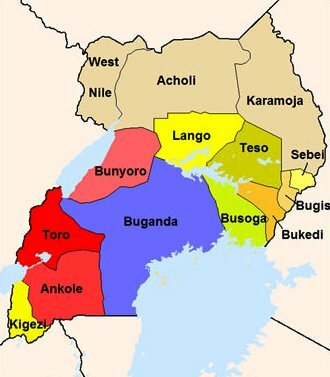 On under collection of local revenue, 161 councils registered a shortfall in collection of revenue amounting to Shs 17.1 billion, majorly attributed to failure to carry out revenue enumeration and assessments, non-enforcement of contracts with private revenue collectors, understaffing and incomplete revenue records” (Parliament Watch Uganda, 04.01.2016). If you wonder where it went, than the only ones knowing is the ones that was in charge of transactions and the ones actually taking the monies. The Public Coffers gotten looted without proper procedure for random trades. We can only imagine where the money went. Who used it and for what purpose is not easy to know, if it was buying a great car or house, even if it was paying a side-chick of a local mayor, we do not know. What we do know is that the money left the system without acknowledgement and without needed guidelines of the usage of the funds. That is worrying how easily billions can fly out of the coffers. Brown envelopes of funds easy spent on joy and needed supplies for the elected and public servants without any recites or valid reason for the use. That this is clear indication of the practices and lacking moral of both central government and local government is certain. Certainly if the Central Government cared and the Local Government was worried of repercussions for their misbehaviour they would have acted otherwise and might even tried to payback the funds to the state. Instead, they used it without warning and might be wasted monies on luxury items during the election. When the Local Government even with lacking of protocol extend their goodwill to forge documents to prove the valid use, you know the system is made wrong and need a recharge, there are certainly to many loose ends when they go to that extend to clean their wrong doings. Peace. 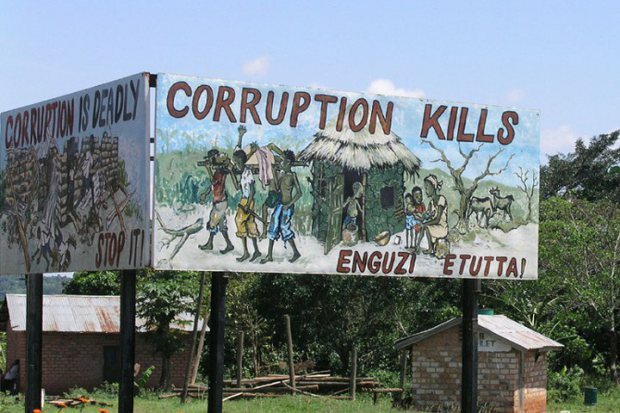 In Bushenyi the Public Servants told to keep their mouth shut and don’t become “News Reports”; in the name of NRM-Regime, they don’t want to be accountable or transparent! 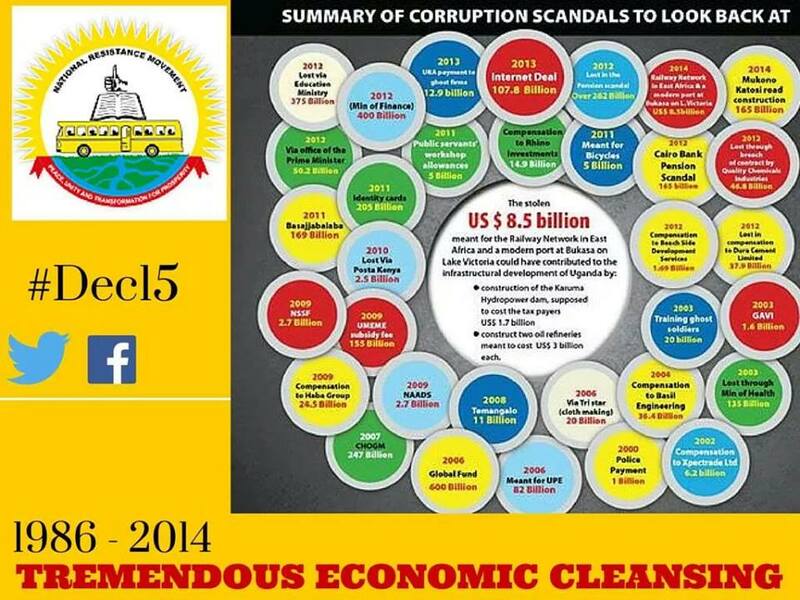 We know that the NRM does not have it in them to be accountable, if so they would have disclosed more information and dealing then they already do. 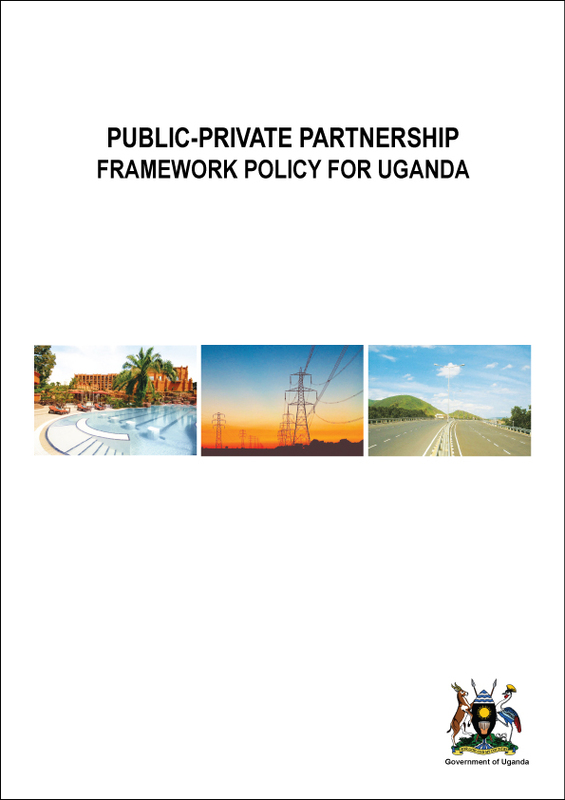 As the land-agreements, oil-contracts, road-development and so on is kept on the low-key instead of in the public spotlight. So when one of the general leaders in the Public Consumption told the fellow civil servants to not share their information with the world. Take a look! ” Ms Pauline Nakayenga, told the leaders that information for public consumption is released only by mandated offices. She said revealing the information by anyone else can cause confusion” (…) “Commit yourselves to public service and be faithful to the offices you are taking. Keep government secrets, don’t become news reporters. Government and public information is released by the district spokesperson who is, in this case, the CAO [chief administrative officer] or district chairperson,” said Ms Nakayenga” (Amanyisa, 2016). This law from the first Obote I Government is still in action and therefore, when it is valid it is useful in the discussion. Section 8: “Any member or officer of the commission and any other person who, without the written permission of the Minister, knowingly publishes or discloses to any person otherwise than in the exercise of his or her official functions the contents of any document, communication or information” (…) ”which has come to his or her notice in the course of his or her duties in relation to the commission commits an offence and is liable to a fine not exceeding two thousand shillings or to imprisonment for a period not exceeding twelve months or to both” (…) “Any person who knows of any information which to his or her knowledge has been disclosed in contravention of subsection (1) who publishes or communicates it to any other person otherwise than for the purpose of any prosecution under this Act or in the course of his or her official duty commits an offence and is liable to a fine not exceeding two thousand shillings or to imprisonment for a period not exceeding twelve months or to both”. So the laws are already strict as a Public Servant the disclosed material and documents are supposed to be secret and talked about, there even possibility of being fined or being imprisoned up to a year. So Ms. Nakayenga is actually speaking as the law is confined to, even if she knows it or not. Still it is a worrying sign that the Public Information does not the information out or prove their accountable and transparent towards the citizens they claim to serve. In any instance that is worrying. It is also worrying how quickly I could find a law fitting the NRM-regimes wish for secrecy of Public Office and the Public Service, and their Public Servants! In my opinion it is not healthy when the Government does not express its will or its works; as then they have to hide what they’re doing and cannot been seen as accountable. If all work happen in secret then the Public Service is not for the people, but for the elite and the Government itself. And the Government is supposed to serve its citizens with the necessary services and security. Certain secrets are supposed only to be governments ones. But not all and the Civil Servants or the Local-Council and Local-Government should sometimes disclose information so that the public would actually know what is happening with the donor-funds, the taxpayers money and the planned operations and the budget use of the county. Without being seen by central and other Government Officials as “News Reporters”, that is just vindictive. She did not define secrets, is everything the government do a secret? Is it filing the documents on land-owners in a county a secret? 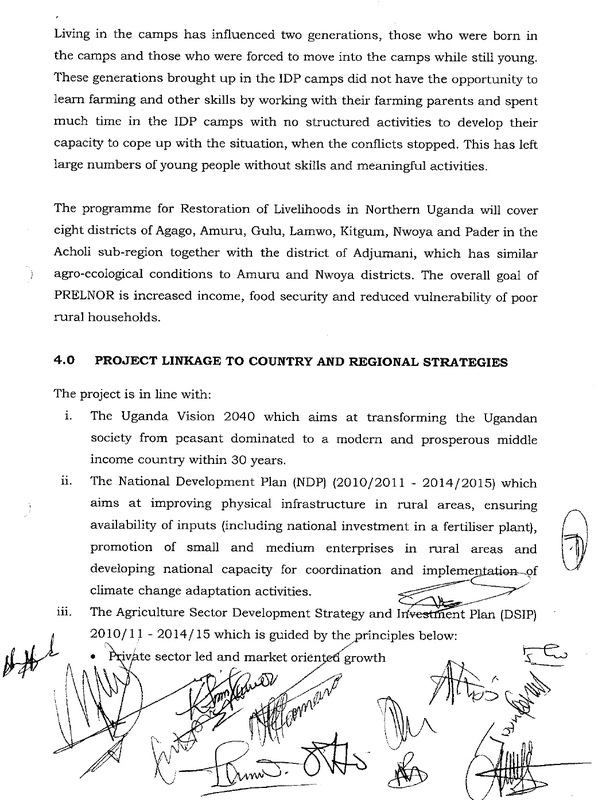 Is the next official contract for which Telephone Company Bundibugyo district is using for their employees? Should that be kept low-key or be told if the locals want to know and also know how much the local-council get funded for their usage of their smart-phone, or is that a secret? Because if all business of the government and the local-council is disclosed and kept a secret, then the government is shadowing the public; and can do whatever they want without question unless it is visible killings. Still the certainly a culture amongst the NRM and the NRM-Regime to not tell or not wanting to tell their planned actions in public as the public does not need to know in their opinion; that is why under the Election Day the VPN was used and the Electoral Commission wanted to ban cameras and mobile-phones at the Polling Stations. Peace. 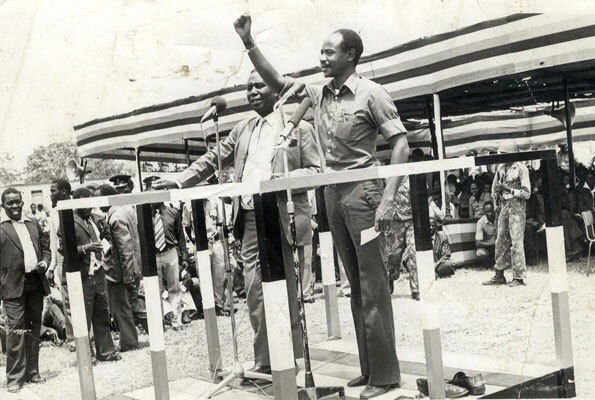 If you thought the weekends reactions to the FDC party and their struggles to do party work and campaigning that has been an issue for a long time. The interesting about what I have seen and gotten news about, is how the Police and the Public is reacting in the ruling NRM-Party! While doing their duties to vote in the Primaries Election. So they can pick the ones to elect their own local leaders and who set to represent their area and a possible MP in the future. NRM-Regime goes even too far with the rigging and malpractices with the NRM Electoral Process and Commission who let this practices happening. We can see what has happen today and the reports are staggering, also with the former day’s events in Ngarama and Lwengo. All of the reports from National Resistance Movement Primaries should be seen as a warning. This is not looking good and with all the reactions the results and local disarray can be seen as the people see through the malpractices and rigging. “Supporters of Mr Benon Matsiko Kyampa, who was contesting for NRM flag for Ngarama LC3 top seat stormed the sub-county headquarters where they abandoned their party cards protesting poll results announced by the sub-county registrar, Mr Robert Baingana, in favour of Mr Silver Kiiza”. This led to even rubber bullets and agony in the district. So the way the police is used to quell issues is really a pattern. Which lead to this: “The deputy RDC Isingiro, Mr Damiano Turyatunga, said they will investigate why police fired bullets and will ensure calm is restored in the area” (Mugume, 2015). “Ruling NRM party supporters in Lwengo District have threatened to boycott party primary elections over alleged inflation of voters registers. The supporters claim that a big number of registers in the district have been bloated with names of people who are not NRM supporters- something they say is a plot to rig votes in favour of some candidates” (…)”Ms Nakabira said she had discovered that some NRM village registers contain several names than those in the national voters register of the Electoral Commission. “Our party electoral commission should not bother bringing election materials to Lwengo District if they fail to sort out this mess. It will be a political suicide to take part in an election where registers have been filled up with ghost names,” she said” (Malik, 2015). 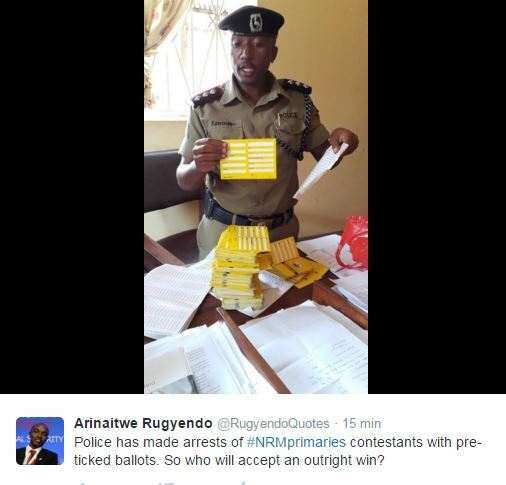 There have been reports that the District Leader George Mutabazi has fled the offices and area with the ballot boxes. There been reports of fraud there in local elections as well and the NRM members couldn’t accept it. 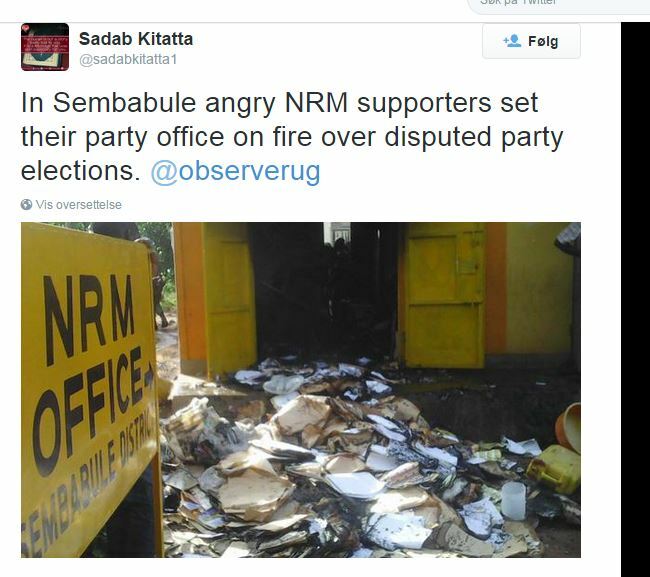 Therefore they set the NRM office on fire this 13.10.2015. Because of electoral issues and vote rigging NRM members has put on fire their member cards and also been as vile as peeing on Museveni T-Shirts as an reactions to rigging of the local elections. More from the Masaka District is that NRM has withheld the elections results and the reasons are that the winners in the district are suspected to be friendly to Amama Mbabazi. This is happening today! “This afternoon, Masaka District NRM party Registrar declared Ssekiwala winner after polling 2664 votes against Ssebulas 1780 votes. However, the declaration of Ssekiwala as winner has not gone down well with Ssebulas supporters” (Bindhe, 2015). There was another NRM office that was lit on fire. This was Isingiro on Sunday 3: AM, it apparently destroyed the older files from 2011 Elections and a dozen other party official papers. “She however, wants the complaints to produce evidence to substantiate their claims of rigging” (…)”Angry voters throwing pelting NRM party cards after disagreeing with NRM party officials at Endinzi sub county headquarters in Isingiro district” (Kabasongora, 2015). “According to Idrisa, initially, Kifunga announced Steven Mugisa as the winners of the Bubukwanga Sub County chairperson NRM party ticket but later altered the results and declared his rival George Baluku” (Muhindo, 2015). 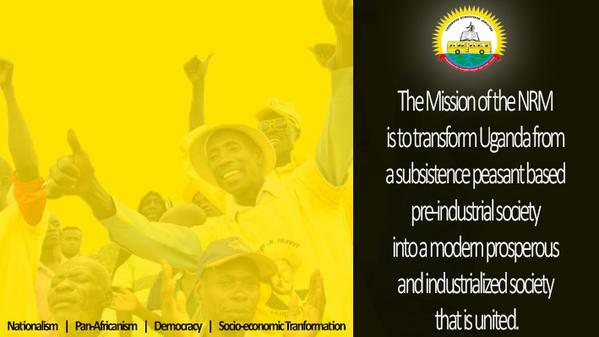 While this has happen during the elections in the NRM there are certain people who are impressed by the work. MP Cecilia Ogwal said: “”Dr. 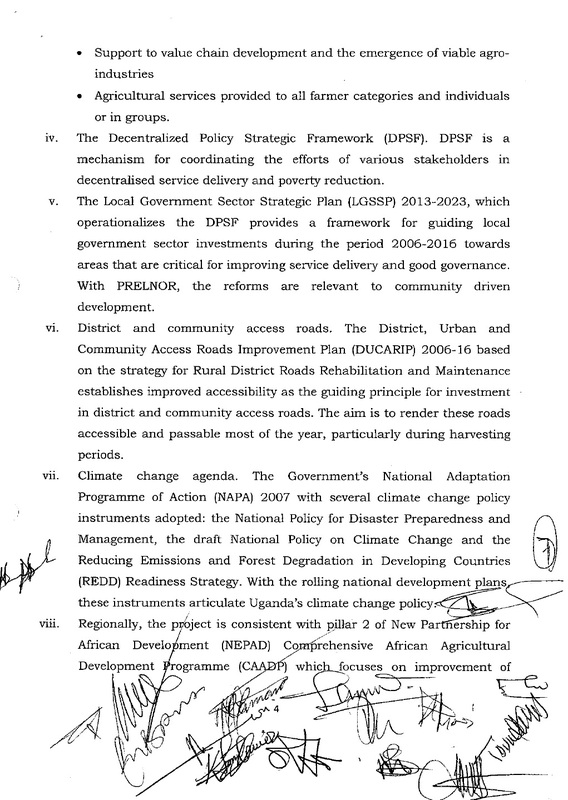 Odoi should be reassigned to assist Kiggundu because what he is doing is so impressive” (…)”We feel the impact of their confusion and I want the process to be peaceful” (Okino, 2015). We can all see that there is a tone in the day and recent days when it comes to the NRM Primaries. The results and reactions show the issues that this Primaries Elections in the NRM are turning into a farce. Where the actual election doesn’t really matter and members of the party feels fooled. Therefore going into means that are harsh realities are not sinking in. This is important when the ruling elite and the main NRM-Regime are shielding in a way. They are shielding the elite and handpicking their loyal candidates, but not the ones that might be wished from the grassroot-organization who might want another candidate and get a change of leadership. With the rigging happening then the exercise and voting is just a planned move so that it looks like a democratic choice. That is what is happening if you score away the local constituencies from picking their men or woman to be representatives. This is what has happen. And that makes the process illegitimate. The representative won’t actual represent the people, but the rigging Electoral Commission of the NRM. The Local Council and MPs might be “elected”, but in reality just picked by the Commission not the people of the Party and Organization. When there has already been famous for the rigging of the General Election in 2011. This here is a new low. 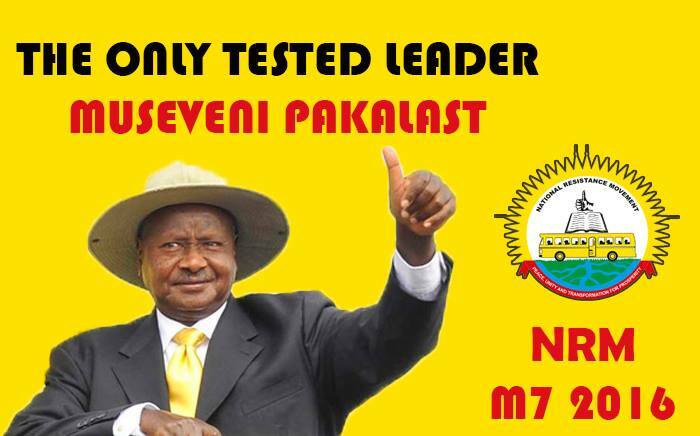 Yoweri Kaguta Museveni party is rigging itself and people are reacting. This can only get more interesting. 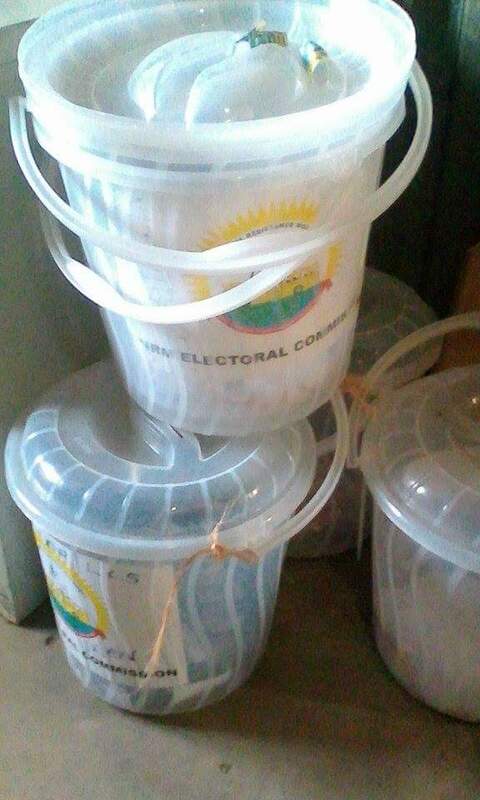 Just as this picture from a Cell in a Prison where they kept the Electoral Ballot Boxes for the Primaries in the area. 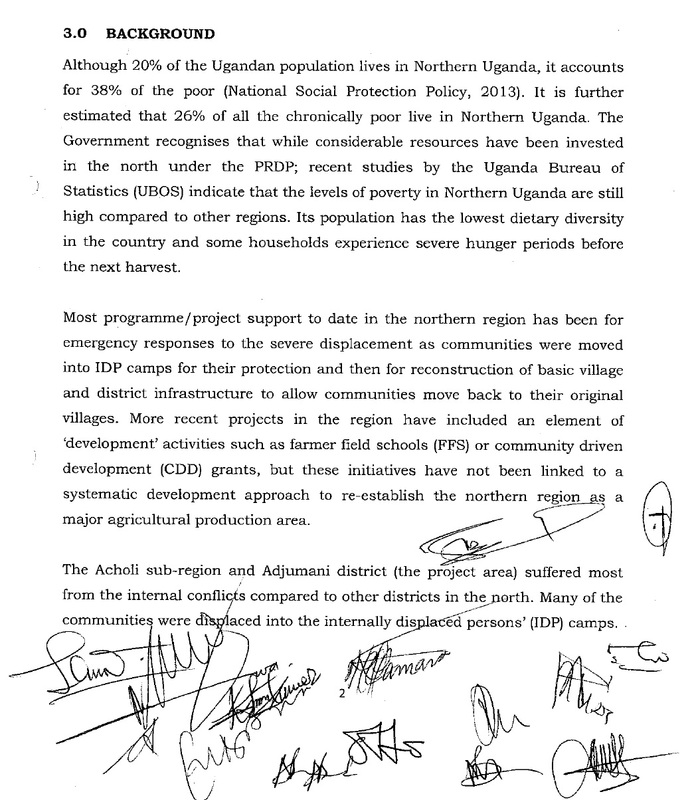 This was taken photo from somebody kept in Prison of the FDC. Peace. On October 2, 2015 the Electoral Commission announced the amendments passed by Parliament of Uganda to Presidential and Parliamentary Acts in preparation for the 2016 elections. Among the announcements was the increment in nomination fees for aspirants in the 2016 elections. Barely two months to the nomination of members of Parliament and Local Councilors MPs passed nomination fees which in the opinion of women of Uganda is intended to bar many upcoming women and youth from accessing political positions of leadership. According to the amendments, MPs are expected to pay nomination fees of 3,000,000/- up from 200,000/- in 2011. 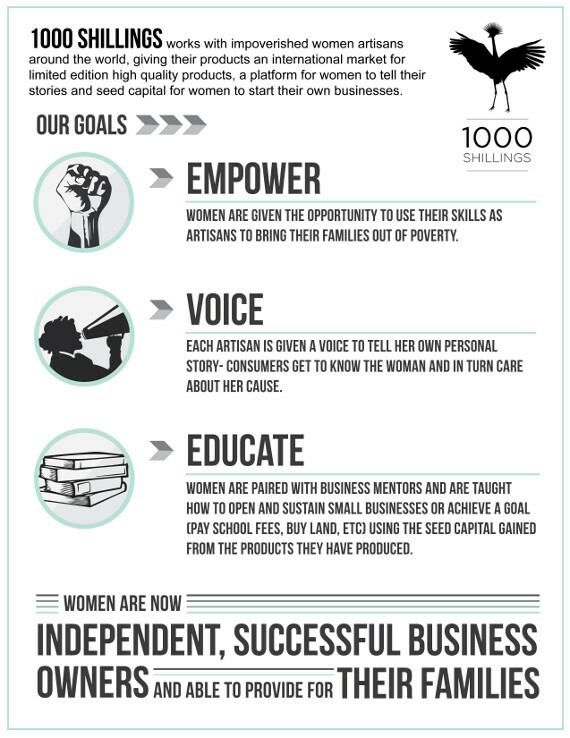 It is a fact that most women and youth are challenged by limited resources and face an uphill task to raise money to contest in an election. The majority of civil servants are teachers some of whom are preparing to contest in the forthcoming elections. 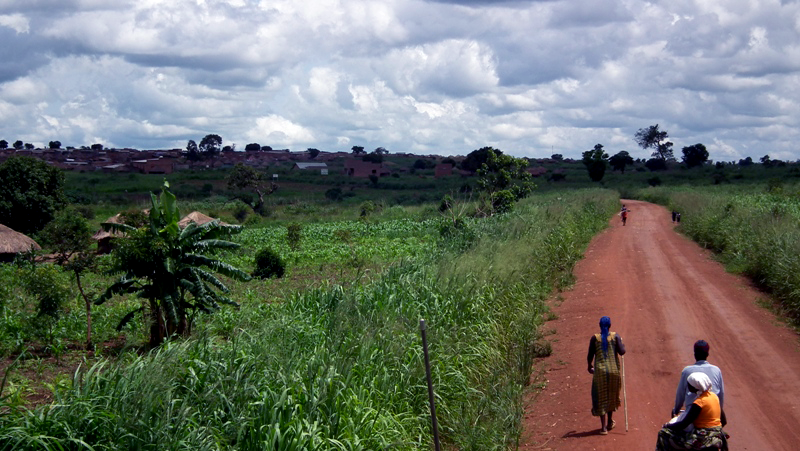 On average, a secondary school teacher in Uganda takes home about 450,000/= per month while their counterparts in primary school earn about 250,000/=. The newly passed nomination fee for MPs and local councilors is simply out of reach for the majority of Ugandans who would want to serve the country. It is common knowledge that aspirants must prepare for their election and fundraise. However, this can be done more easily if candidates are not caught un- aware about critical items they must raise money for like nomination fees especially within an unrealistic time frame. In addition, political parties which at times assist candidates with nomination fees do not have resources since majority hardly receive any funds from their members. The President of Uganda H.E. 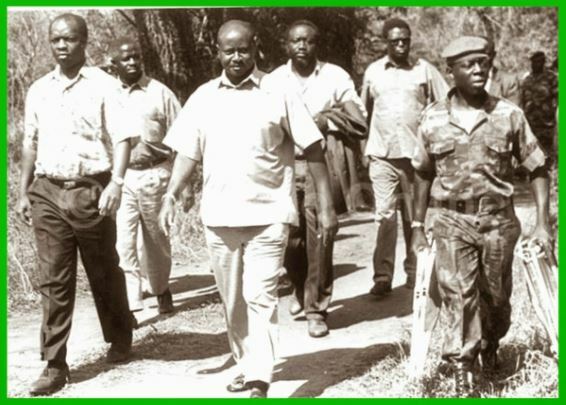 Y.K Museveni has on a number of occasions professed the importance of quality men and women in leadership. In 1995, affirmative action was passed by Parliament to give women, youth and people with disabilities an opportunity to participate in leadership by redressing imbalances created by history and tradition. This law therefore goes against these principles and is a back track on the importance of providing equal opportunities for men and women in leadership bearing in mind the limited economic opportunities in Uganda. We are therefore calling on all political parties to reject this amendment in its totality. We call for a revision of the amendments in order to enhance participation of citizens especially women and youth in the forth-coming elections.